January showers bring.....babies! - Stop staring and start sewing! UPDATED WITH DOWNLOADABLE PDF PATTERN HERE! It's been a long time since I went to a baby shower. Actually I think the last one I went to was my own when I was pregnant with my son (who's 18 months old now), but before that it was a while because I think all my friends are done having babies and are now starting to have grandbabies (yikes!). I had fun putting together some pink things for my friends soon-to-be-born granddaughter. I bought a set of onesies and appliqued some simple things on them and put together these burp rags with some flannel and fabric I had. So really the only cost was the onesies because I had everything else on hand. Nice. The pink print is one of Anna Griffin's designs and I love this sweet shade of pink. It's super soft too. It only took me a few minutes to whip these burp rags together since I just stacked the fabrics and used my rotary cutter then serged the edges (each one has flannel on one side and the pink woven fabric on the other). Here's the pattern I use. When I cut it out I ironed some heavy duty interfacing on it and I just keep it up in a clip hanging on a nail by my cutting table. 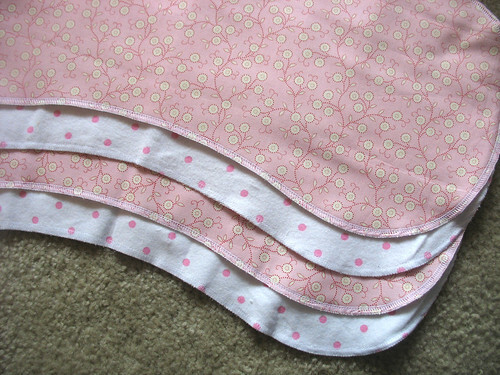 I can't count how many times I've made burp rags with it and it makes a much appreciated gift (pretty yet practical). It's especially great when you're short on time but want to bring something handmade. Fun!